For starters, GPON means Gigabit Passive Optical Network. 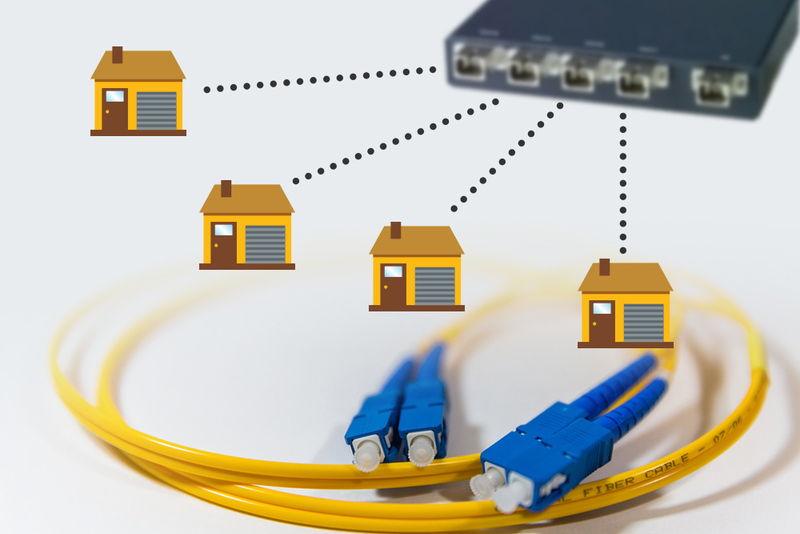 It is a point-to-multipoint access network with a main use of passive splitters in the fiber distribution network, which means enabling a single fiber from the provider to do what multiple fibers used to: serving multiple homes, business establishments and companies. In today’s market, it has the highest speed, longest life and lowest cost network infrastructure. No wonder GPON is widely used in the IT community, like organizations and companies big and small, even households. Everybody wants a fast service, and GPON provides that with a downstream capacity of 2.488 Gb/s and an upstream capacity of 1.244 Gb/s. Take note, THAT is shared among multiple users. As of today, GPON is considered the strongest candidate for widespread deployments that provides fiber to the home. Yes! Internet access, everyone’s favorite friend. We all need the internet, whether to connect with friends from long distances or to post something you feel is worth sharing. With the technology that is fiber optics and add it with GPON, you can surf the internet ten times faster than an ordinary connection and upload photos and videos immediately without any interruptions. Remember the downstream and upstream capacities mentioned above? That only makes your internet access smoother than it ever was before. Simply put telephoning with the use of internet, that is VoIP. Having a reasonable quality internet connection is a must for VoIP, because of course, it uses internet to send converted analog voice signals into digital data packets to its destination. VoIP allows you to make a call directly from a computer, a special VoIP phone or just a traditional phone connected to a special adapter. So, it is essential in VoIP to use GPON to have a very clear reception when talking on the phone over internet connection. Another trend today is video-on-demand, which is basically choosing to watch movies or TV shows whenever one wants to. Video-on-demand also uses the internet, where you can access various internet television networks or streaming services. Just think of a household having multiple televisions, imagine the wirings needed and space it takes up or the hassle of setting it all up. That’s where GPON is needed, making a single fiber do what multiple fibers used to do. The connection is distributed to multiple televisions and with high bandwidth, you will enjoy watching TV shows and movies more than ever without disruptions. Security is everyone’s need, so what better way to use GPON than using it on security systems. Basically, security system is easily defined by its name which means a system that enforces boundaries between computer networks. Consisting of hardware and software components, security systems limit the exposure of a computer or computer network to risks like cyberattacks from hackers. Nowadays, almost everyone is ramping up their security measures because cyberattacks are everywhere today, it will attack you in different ways. That’s why GPON is a very important part in a computer network, to fully maximize its uses especially security. DAS is used in large buildings, installing a network of relatively small antennas that serve as repeaters that distribute signals from a common source to provide wireless service to isolated areas with poor coverage. Imagine the space GPON will save if used in a distributed antenna system. With only a single fibre to use that makes up for multiple fibers, it lessens the overall structure of the system but in return gives a very efficient output. It also saves money for the owner, because GPON is the lowest cost network infrastructure available in the market.